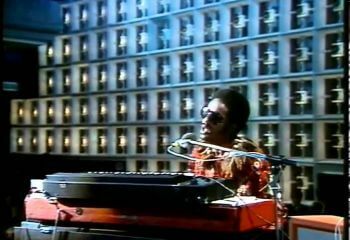 The 70's were undoubtedly the most important creative stage of Stevie Wonder. He had gained his artistic independence to do what he wanted, and he did not disappoint. From his privileged musical mind emerged unique and unforgettable works with Talking Book, Innervisions, or Songs In The Key Of Life. Signifying his consecration as genius of the music, getting to pulverize records of Grammy awards. His concerts and shows were increasing, going through much of the planet. Great musicians accompanied him like Reggie McBride, Ray Parker Jr, Ollie E. Brown, or Michael Sembello. Also noteworthy were the female vocal group with which he was surrounded in concerts and shows called "Wonderlove", which included great voices such as Deniece Williams, Shirley Brewer, Lani Groves, Syreeta Wright, or Maysa.